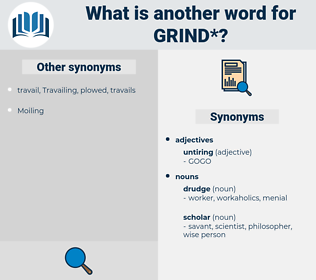 What is another word for grind? backs to the salt mines. wrought oneself to the bone. milling, polishing, routine, chore, iteration, grinding. inertness, inertia, fun, play, entertainment, relaxation, goldbricking, dalliance, underachiever, repose, loafing, slacker, lowbrow, idleness, sport, leisure, rest, goof-off, goldbrick, recreation, ease, lolling, amusement, inactivity, diversion, lounging, dormancy, decompression. 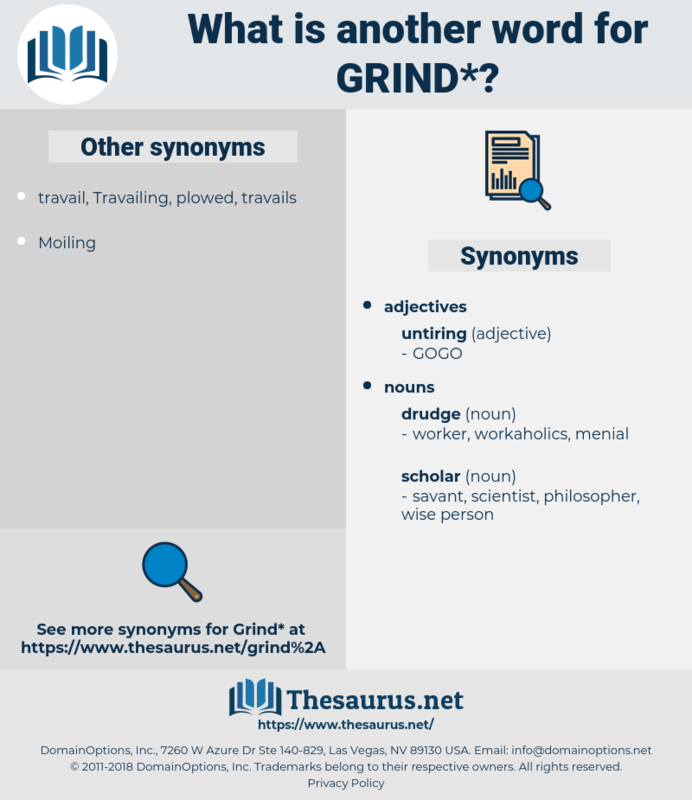 Till the spring I must work - that is, at senseless grind. Kill us, torture us, condemn us, grind us to dust; your injustice is the proof that we are innocent. masticate, jaw, manducate, chew, gnash. fragmentize, fragment, break up, fragmentise. forge, shape, work, create, make, mould, mold, form. trip the light fantastic, trip the light fantastic toe, dance.